DJR Team Penske’s Fabian Coulthard wins the first race of the Red Rooster Sydney SuperSprint at Sydney Motorsport Park, the 17th race of the 2017 Virgin Australia Supercars Championship season, scoring his fourth win of the season and the ninth V8 Supercars victory in a career. The driver of the #12 Ford Falcon took the lead on lap 22 (of 31) passing by his teammate Scott McLaughlin. Two laps earlier, McLaughlin was involved to incident with Red Bull’s Shane van Gisbergen while fighting for the lead at the restart, following a Safety Car period because of debris on the track. A contact resulted with Van Gisbergen’s spin and he dropped to the back of the field. McLaughlin continued to drive but received 15-second time penalty, finishing 10th after all. Van Gisbergen fought back to 15th place at the end. 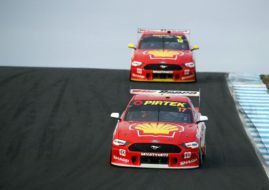 In the first part of the race, which McLaughlin started from pole for 12th time this season, Prodrive Racing’s Mark Winterbottom was leading for most laps. He pitted later than his rivals and dropped to P6 after all drivers done their pit stops. McLaughlin and Van Gisbergen were in front after the pits until their clash on the restart at lap 20. 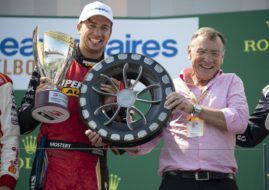 After all that excitement and numerous position changes, Chaz Mostert finished second to grab his sixth podiums of the season (including two wins). The championship contender Jamie Whincup finished in the third place, ahead of Mark Winterbottom and Scott Pye. After 17 races, Scott McLaughlin remains in the championship lead with 1974 points on his account, 78 more than Jamie Whincup. Fabian Coulthard is further 83 points behind Whincup. One more 52-lap race at Sydney Motorsport Park is scheduled for Sunday.